Previous version Path 6.4.0 apk for Android will help you to downgrade or install older app easily. This is one of the best Social apps. In this social media, you will be able to be yourself and express yourself to the maximum. There will be sophisticated tools and also unique filters to use so that you can capture your photos or videos and show the world who you really are. Create as many photos and videos as possible and share them to with everyone you love. If you want to revisit something back then, you can always search your old moments for some throwback. You can do it so easily and you will have so much fun revisit your past moments. Do not worry about privacy when you do that because this app is completed with privacy control so that you can decide who can see your moments and who couldn’t. 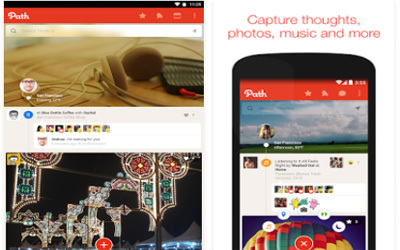 Path for Android is going to make you closer with everyone you love for sure. Better than Likes: Use emotions to better express your feelings towards a friend’s post on Path-smile, frown, laugh, gasp, or love. Inner Circle: If you find yourself with too many friends, get back to simpler times by setting up an Inner Circle of friends or family. Private Moments: Even your most private moments are safe. Post a moment private to just yourself, or with a group of people you choose. You can filter your timeline to show moments from everyone you follow, just your friends, or your Inner Circle only. We’ve updated the design of the Friends tab to make it simpler to find your friends on Path. Celebrate your friend’s birthday by adding #HappyBirthday to a Thought moment. We heard your feedback loud and clear! Now you can upload videos up to 1 minute. Search great moments easily from explore. Nice halloween surpise, but Android 6.0 Marshmallow users need optimization, still can’t upload video.